All the silk pictured is quality China silk. They have hand rolled hems and are hand dyed using color fast and light fast dye. These silks will never fade nor wash out. We use four kinds of silk: habotai, gauzes, charmeuse, and Crepe de Chine. 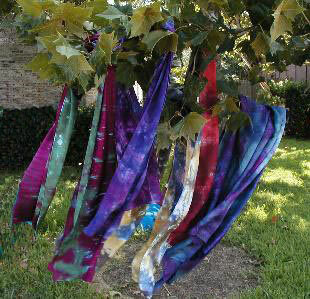 All of these are hand dyed by Chrystal & Tambry in Denton, Texas on Chrystal's front lawn. (Yes the neighbors think we are nuts.) No matter what the season it looks like spring has hit in full force when we are in full swing. We can do custom orders on request however dye being what it is we can not guarantee specific results. We call our silk Picture Silk. You will never get bored looking at the amazing patterns we achieve. Each piece is an individual work of art with a unique pattern where you can discover something new every time you look. If you have any questions or would like to own one ot these "one of a kind" creations please email us.